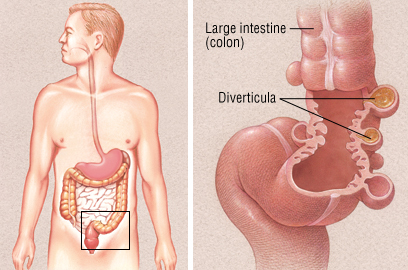 In diverticulosis, small pouches develop and bulge out through weak spots in the walls of the colon, typically in the part of the colon called the sigmoid colon on the left side of the abdomen. These small, balloonlike pouches are called diverticula. The condition is more prevalent as people age. For example, it is estimated that half of people in the United States aged 60 to 80 have diverticulosis, but only one person in 10 develops it by age 40. It is equally common in women and men.